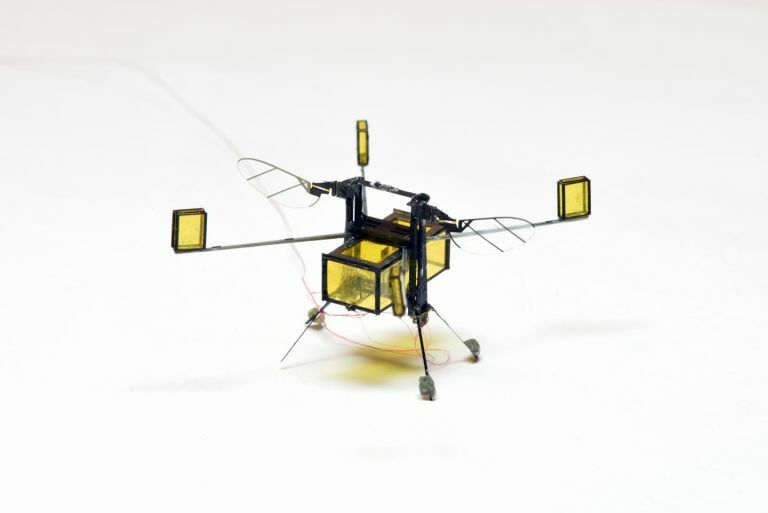 RoboBee is a paperclip-sized microbot with an explosive launch system. Inspired by biology, this carbon-fibre flying machine can hover, dive and swim. It's got a carbon-fibre body, wafer-thin wings and ceramic muscles that expand and contract in response to electricity. And this week, it's had an upgrade. RoboBee can now explode into the air thanks to four flotation tanks and a chamber that turns water into flammable gas. The bot is so small that surface tension at the water’s edge clings to it like glue. According to Harvard, it adds up to more than 10 times the bee’s weight. To break free, RoboBee fills its tanks with oxyhydrogen, made using an electroplate in the central chamber. This lifts the wings clear of the water. Then, a spark ignites the gas and the bee rockets upwards. "While flying the robot feels as if it is treading water; while swimming it feels like it is surrounded by molasses. The force from surface tension feels like an impenetrable wall." RoboBee is the brainchild of scientists at the Harvard John A. Paulson School of Engineering and Applied Sciences (SEAS) and the Wyss Institute for Biologically-Inspired Engineering at Harvard. In the future, they hope the microbots will make themselves useful in crop pollination, surveillance and search and rescue. The Hubble Space Telescope has spotted wobbly galaxies, and it’s got physicists confused. Around 25 percent of the universe is 'dark matter'. It's invisible and current tech can't detect it, but we can see the effect it has on galaxies. It's thought to sit around them in a halo, accounting for strange phenomena like gravitational lensing. But Hubble's latest data casts doubt on the current model of how it works. Galaxies group together into clusters surrounding a 'brightest cluster galaxy'. These celestial lynchpins should stay more or less in the centre, held in place by dark matter, but the latest data shows them wobbling. Hubble looked at 10 galaxy clusters and found their brightest cluster galaxies up to 40,000 light years adrift. This goes against predictions made using the cold dark matter model. Scientists reckon there are two possible explanations. Either, there’s something odd going on out there that we haven’t seen before. Or, the standard model of dark matter is wrong. According to the ESA “This may indicate that new fundamental physics is required to solve the mystery of dark matter.” Watch this space. The National Institute of Standards and Technology (NIST) want to 3D-print fuel cells, and they're developing the tech to make it happen. They've combined ‘metal-organic frameworks’ (MOFs) and 3D-printer plastic to make a material that captures hydrogen. MOFs are able to catch specific molecules, grabbing hold of gases and sifting them out of the air. And printer plastic is full of holes, providing ready-made channels for the gas to pass through. The MOFs are like dust when they’re first made, making using them as fuel cells impossible. But, combining the grains with plastic creates a hydrogen-catching material that can be printed into any shape. "The auto industry is still looking for an inexpensive, lightweight way to store fuel in hydrogen-powered cars... We're hoping that MOFs in plastic might form the basis of the fuel tank." At the moment, the capacity of the material isn’t quite up to fuel-cell standards. It needs to hold 4.5 percent hydrogen by weight, and currently only stores around one percent. But, the team working on improving the tech, and they say fuel-cell capacity is just a matter of time. Here they are explaining their work with the help of puppets. Watch out for the man in the yellow boiler suit, he’s a flying-carrot-catching pro.